Coachella, the music festivals of all music festivals, concluded this weekend with a star-studded set of music and no shortage of fashion moments (like Alexander Wang's H&M announcement). 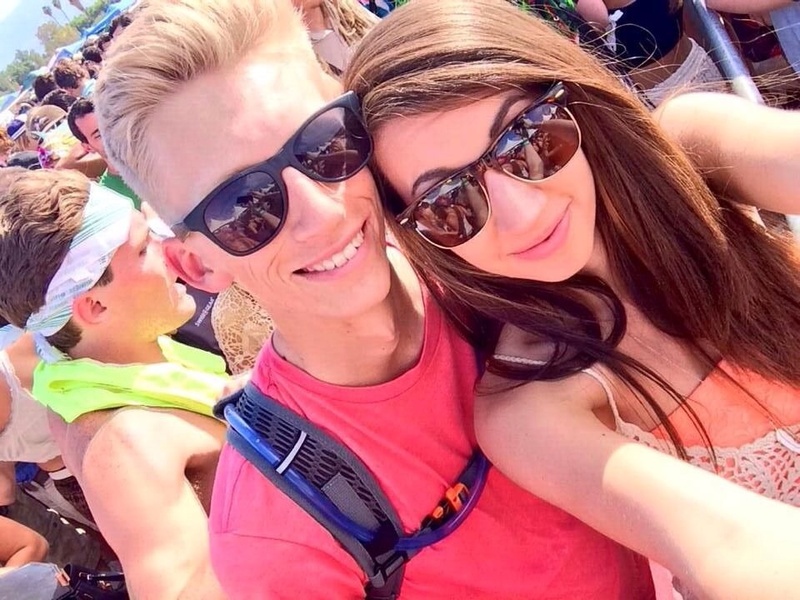 My friends (who happen to be Palm Desert natives) Courtney Fisher and her beau Christoper Putman got to experience Coachella in all of its primal, electrifying glory. 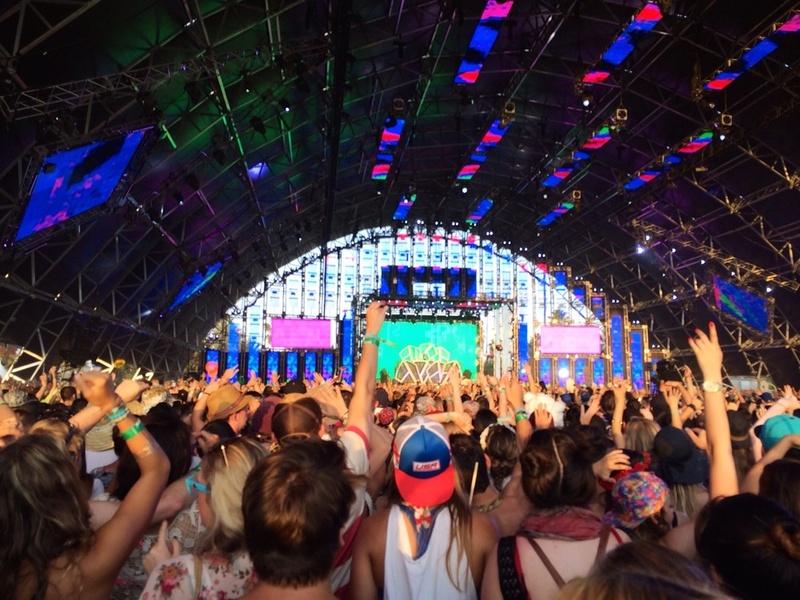 Who were your favorite performers at Coachella? Courtney: Pharrell's performance was brilliant. He brought out Jay-Z and Usher. I also loved Calvin Harris and Ellie Goulding. Chris: I totally agree, the entire Pharrell performance on Saturday night was by far my favorite part of Coachella 2014. I'm a huge hip hop fan so all of his special guests like Jay Z, Usher, Busta Rhymes, Pusha T and even T.I. made that performance one of my all time favorites. My other favorites were Calvin Harris and the Dillon Francis. Which Coachella style stars inspire you the most? Courtney: Definitely Selena Gomez, The Jenners and Vanessa Hudgens. Chris: I was actually inspired by the movies Lords of Dogtown and Fast Times at Ridgemount High when it comes to Coachella style. What did you wear to the festival? Courtney: I wore a lot of my favorite brands like Forever 21. One day I wore a crochet top from PacSun and American Eagle high-waisted shorts. I wore vans with all three outfits because those are my favorite shoes. Chris: This year, the pocket tee was my go-to look: colored tee shirt with a vibrant patterned pocket paired with some cut off shorts and Vans. Simplicity was key. Sunday I had an acid wash black tee with Acid Rap in tie dye and some board shorts and Vans. Acid Rap is the title of a mixtape from my favorite artist, Chance the Rapper, who was supposed to perform on Sunday but "fell ill" and didn't play. but I still showed some love. How would you describe Coachella style in general compared to your own personal Coachella style? Courtney: Coachella style for a lot of girls is about the flower headbands, dresses and sandals. But I was more practical with my approach, making sure I didn't have to worry about a dress falling off or flying up while dancing or my toes getting stepped on. It's really dusty on the grounds there so closed toed Vans that were already a little old were a good option because that way I didn't have to worry about getting new shoes or my feet dirty. Chris: I see Coachella as a modern day Woodstock with how the women dress and the majority of the men just kinda dress in whatever feels comfortable. My sense of style is as California as you can get, so I found my style unique since the majority of Coachella goers are out-of-towners. 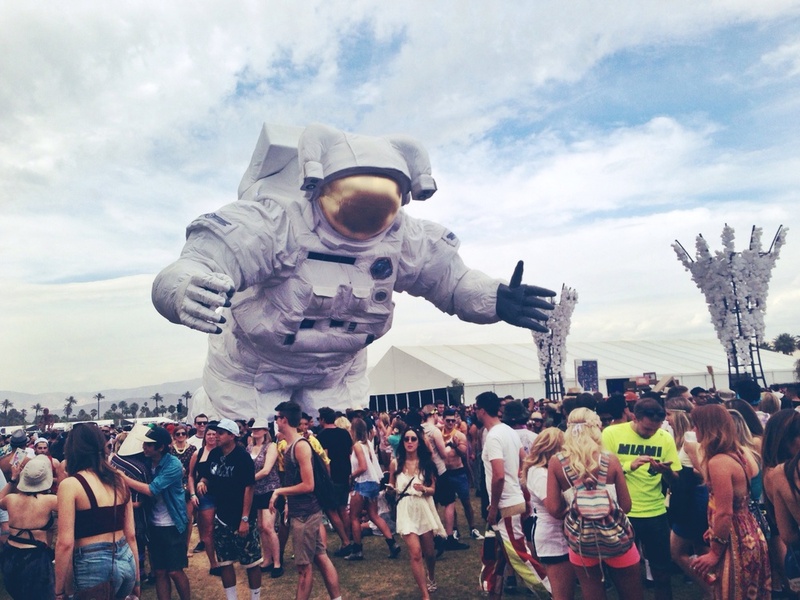 What was the coolest piece of clothing you saw at Coachella? Courtney: I liked Kendall Jenner's long flowy top that she wore the first weekend. What was the worst piece you saw? Courtney: Some girls were barely wearing clothes. A lot of inappropriate outfits or lack thereof and items that really didn't piece together well. Chris: Some dudes were wearing only underwear... Which wasn't cool. When you go to Coachella again, what will you do differently? Courtney: Less compromising for other people. Sorry friends, but when I want to see a band and you want something different, we may just have to part ways next time. I don't want to miss any good performances on the account of trying to make it work with everyone, because it just won't. Chris: Same. I would watch the bands that I wanted to watch, I got to watch the majority of them but I didn't get to see a couple because their were other bands playing at the same time. What advice do you have for people attending music festivals this summer? Courtney: Stay hydrated, safe and responsible and try to plan out your day/sets as best you can prior to the start of each day. Chris: Find a group of people or a friend/ girlfriend that you know you will have fun with.. Because music festivals are all about having fun. If you could hang out with any celebrity at Coachella, who would it be and why? Courtney: Ireland Baldwin, I think she has cool style and seems to have a lot of fun. Chris: I would probably hang out with any of the DJs from the Sahara tent because they always look like they know how to have a good time. They have women around them constantly and they have a very broad taste in music. Describe Coachella in three words. Follow Z Life for more Gonzaga online fashion and lifestyle content.